I noticed this again when switching the template mode from Classic to Native/Paired after upgrading a site from 0.7 to 1.0-beta2. @westonruter Did you happen to notice which post types were selected? Was it just the default of Posts? I was able to reproduce the notice blasting conditions when upgrading from 0.7 to 1.0-beta2 but only when the default post type of 'Posts` was selected (none of the others). Then upon upgrading and switching from Classic to Paired or Native, the notice blasts occurred. When first switching from Classic to Paired or Native, notice that the Serve all templates as AMP regardless of what is being queried. , i.e. option amp-options[all_templates_supported], is on (checked) by default. We should revisit what state we want that all_templates_supported option to be when first upgraded or installed. If first installed, then it can be set to on. Else, set it to off as the default and use the post types that were previously set in the last version of the plugin. Did you happen to notice which post types were selected? Was it just the default of Posts? Yes, just Posts was selected, and forcibly so since the checkbox is disabled. Yes, the two options you've outlined seem perfect. If all post types were not selected when upgrading to 1.0, then all_templates_supported should be initially false. Initialize `all_templates_supported` to `false` on version change. When the plugin's version changes and the options are empty (meaning no options were stored previously), then `set all_templates_supported` to `false`. then the settings page was blasted with erroneous admin notices. See issue #1302. This commit fixes that edge case. Why not use `upgrader_process_complete` hook? This hook works when updating from the WordPress.org plugin directory. However, when working with bleeding edge, we need to validate during the options manager init cycle. You switch from Classic to either Paired or Native. It's not directly linked to upgrading, although it does occur when upgrading. At first I walked down that path to fix the upgrade process and setting all_templates_supported to false (i.e. see PR #1337). However, it occurs to me that if no options were saved in a previous version of the plugin, then the plugin is in a default state. 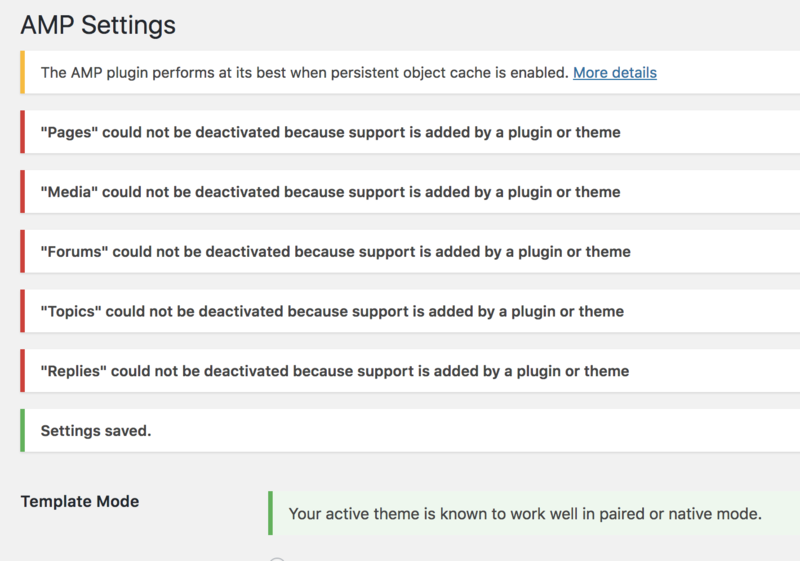 Now, I believe the root cause is in how or when we are validating the supported post types against the theme/plugin and what has been selected. There is a linkage between all_templates_supported and post type/template selections. Use all eligible post types when all_templates_supported is selected. In the `check_supported_post_type_update_errors()` method, when `all_templates_supported` option is selected, we want to use all of the eligible post types and not just the ones that are individually selected. In doing so, this commit fixes #1302 where it blasts erroneous notices about unable to deactivate supported post types. If it's alright, I'm moving this to 'Ready For Merging.' It looks like reproducing this on the staging site will be complex, though we could create a new site for this if you think it's important.